Black and white photograph taken by Jim Garvin, official photographer for the University of Maine in the 1950s and 1960s. 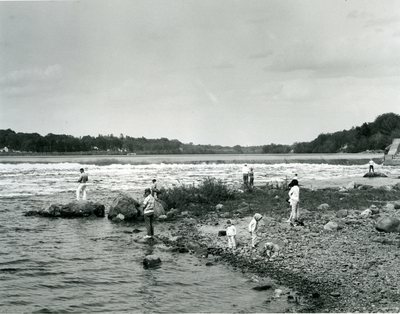 The back is labeled in handwriting, "Bangor Salmon Pool July 1964." Appears to be just below a dam taken from the east shore of the Penobscot River.